I took a drive down A1A from Ormond Beach to Ponce de Leon Inlet, which is about 15 miles down the road from Ormond Beach. The drive is beautiful, so roll your windows down and breathe in the sea salted air. 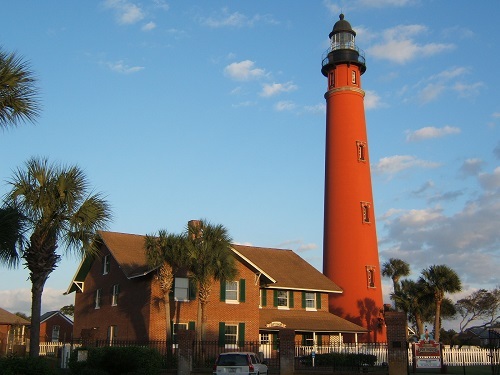 The area is home to the Ponce de Leon Inlet Lighthouse and Daytona Beach Parasail. The lighthouse was completed in 1887 and can be seen as far as 20 miles out from sea. In 1972, the Ponce de Leon Inlet Lighthouse Preservation Association was founded as a non-profit organization to restore and operate the property as a museum. The Ponce de Leon Inlet Lighthouse is now listed as an operational private aid to navigation. Across the street from the giant red lighthouse stands the Daytona Parasail center and dock. I have never been parasailing before, but the reviews are great and I figured it would be an exciting new experience. I wasn’t wrong! As I entered the building, I met Linda who helped me decide on the perfect height to sail. They offer sailing heights of 600, 800, 1000 and 1200 feet. I was a little nervous about choosing 1000 feet, but there was an eight year old in my group that chose the same height, so that gave me a little more confidence. When it was time, our group of 12 people plus the Captain and photographer boarded the boat and set out for the ocean. The Captain took us through the US Coast Guard safety instructions and handed out the parasail straps and life jackets. Once we were out in the open water, it was time to fly! Up to 3 people in a party can parasail at a given time. The photographer on the boat strapped a GoPro helmet to one person in the party to capture their experience. When it was my turn, I had my own GoPro strapped to my head and recorded the amazing experience. The parachute expanded behind me and picked me up as if I was nothing but a feather. I was connected to a rope that extended 1000 feet into the sky. I assumed it would be windy and loud, but once I was in the sky, it was actually quiet and peaceful. The view of the Florida beaches seemed to never end. Below me, I watched as a Stingray swam through the ocean. After 7 minutes, the captain started to pull the parasail back in. After every party had their turn, the boat returned back to land and we were shown a wall of TVs that the photographer had set up to show us the images she had taken. You can purchase your photos and GoPro video at that time. I definitely suggest this on your next trip to the Royal Floridian Resort! St. Augustine is a beautiful city filled with rich history, Spanish culture (art and architecture), and a gorgeous college. It is known for being the oldest continuously occupied European-established settlement within the borders of the continental United States (founded in 1565). The city has continued to thrive throughout 4 centuries, leaving a majority of the area with beautiful historical landmarks. I parked my car near the south part of Flagler College, so that I could walk through the campus and Historic St. Augustine. There are numerous tours that will take you around the town, but personally I like to just walk through the town. I walked down St. George Street, passing the Government House, Cathedral Basilica, and the Castillo de San Marcos. It was too late for me to take a tour in the fort, but I suggest that anyone staying at the Royal Floridian Resort take this journey to explore the old St. Augustine Fort. I have been to the fort many times before and love the history behind its walls. On my way back, I stopped at my favorite St. Augustine restaurant, called the Columbia Restaurant. The Columbia Restaurant is a long-standing traditional Spanish restaurant local chain, dating back to 1905. The cuisine is spectacular and you will feel truly immersed in Spanish culture. Kennedy Space Center is less than an hour and a half from the Royal Floridian Resort and it’s a great place to learn and explore. Upon arrival, you can purchase your day passes to enter the visitor complex. 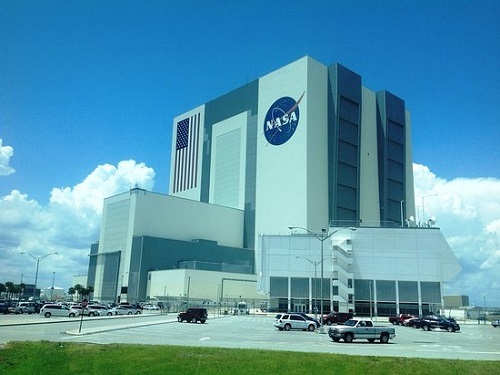 They offer a large variety of bus tours by the Vehicle Assembly Building (VAB), Saturn V center, and more! I spent the majority of Saturday here. My first stop inside the visitor complex was the Rocket Garden, which is a large outdoor display of missiles, sounding rockets, and other space launch vehicles. From there, I moved on to the newest addition, Atlantis. A ship like no other, the space shuttle launched like a rocket and landed like a glider while transporting astronauts to space and back for thirty years. Today, Space Shuttle Atlantis stands inside a museum designed to teach us about the Shuttle program and all the amazing advancements that came from this program. Moving on from the Atlantis, I hopped on a bus tour to go Behind the Gates to see the old and new launch pads and the VAB. There are multiple specialized bus tours that you can take to see exactly what part of Kennedy Space Center that interests you the most. The tour I chose ended at the Apollo VIII/ Saturn V Complex. Inside, the monumental 363-foot rocket that launched America’s brave astronauts to the moon and back hangs from the ceiling. You can learn about the rocket’s history and the journeys that the astronauts have taken. Although a total of 13 Saturn V rockets were launched between 1967 and 1972, this is one of only three remaining in the U.S. It’s an absolute must-see for all visitors. Right now, NASA missions are paving the way for what’s next for the future of space exploration! Last but not least, the sunrise over Ormond Beach was one thing I had to see. Set your alarm at least 30 minutes before the scheduled sunrise time, because you will not want to miss this marvelous sight! I have seen photos and videos of the sunrise over Ormond Beach, but seeing it in person was a brand new experience. It was incredible to watch the sun peak through the clouds and hit the ocean. Do not leave without seeing this! I was filled with excitement throughout this entire trip! Could you tell? I cannot wait to go back again! If I was able to complete these 5 incredible activities in 48 hours, you can do even more during your vacation week! Share your Ormond Beach adventures with us on Social Media!